The conference venue is the UCD Sutherland School Location. Recommended hotels as well as information on getting to UCD can be found below. The St Helen's Hotel has offered a discounted rate to those attending the conference who book before July 1st. Details of how to avail of this discount are outlined below. The Radisson SAS St Helen’s Hotel will only offer the discounted conference rate of €135 if delegates use the booking code UCD School of Economics - BB ID 1960005. Delegates should use this code in order to avail of the reduced rate. This rate will apply to bookings up to July 1st. Your best bet to get from the Dublin Airport to the university is the Air Coach service from Dublin Airport to UCD. It takes 45 minutes and runs every 15 minutes. It costs €14 return. You can pre-book tickets online on the www.aircoach.ie website. The UCD Stop is just across from the campus. The Sutherland School is marked on the map attached, as is a suggested shortest path in red. The Radisson Blu St Helen’s Hotel is on the same bus route (next stop down N11- Fosters Avenue (Radisson Hotel), just a 10 minute walk from where the Air Coach drops you off for UCD. 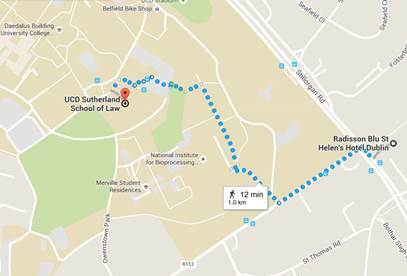 The UCD Campus and Radisson Blu St Helen’s Hotel are both on Stillorgan Road (N11) which is served by a Quality Bus Corridor with high frequency buses to the city centre to south towards Dun Laoghaire. Online route planners may be found on the Dublin Bus web site or Transport for Ireland web site. A map of UCD is available here.